Towns such as Brighton have a wonderful choice of grand architectural styles to entice house-hunters but, of course, inside, the ravages of time coupled with the tastes of previous owners can mean your Regency terraced home can look rather less than grand behind the front door. If you want your property to look the way it was originally designed to look internally, start with the floors – and get any plumbing and wiring jobs sorted while the floorboards are up. 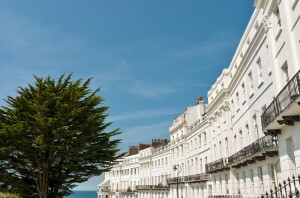 But what flooring in Brighton is appropriate for each architectural style? At Amwick Floors, we have provided advice to countless home-owners in Brighton and Hove – here’s our simple guide to flooring over recent centuries. If your home was built in the 1700s, it may originally have had a stone-floored entrance hall, but other rooms would have wooden floors and carpets. For those wanting to recreate the feel of this period, oak and elm are the woods to consider. But bear in mind that, as the 18th century progressed and wood became more expensive, pine and Baltic fir began to appear, and floorboards themselves became narrower. Regency houses would often feature floorboards that had been stained and polished around room edges, to frame carpets or large rugs. At the end of this period, much less expensive flooring was the norm, with untreated fir and pine common, while polished oak was the preserve of staircases in the homes of the wealthy. Most Victorian houses had plain pine flooring, often covered with rugs. Exposed floorboards could be stained and polished to make the wood look more expensive than it really was. Arts and crafts houses and art nouveau properties were also built in this period. Arts and crafts floors were wood – often oak or more exotic hardwoods – and stone, with tiles appearing as the art nouveau movement became more popular. Art nouveau houses would have carpets, with polished parquet borders. Pine flooring was by now the norm in all but the finest houses, though entrance halls were often tiled. The habit of staining floors around the edges remained, as did parquet coverings, usually in a herringbone pattern. This period saw the rise of movements such as art deco and modernism. Linoleum became popular and parquetry was widespread, with lighter woods used where floorboards would be seen. Restrictions on timber use meant many ground-floor rooms had concrete floors, often to be covered as homeowners saw fit. As time passed, carpets, carpet tiles and, eventually, laminate flooring and engineered wood became hugely popular and, these days, there is a huge choice of materials with which to floor your home – whether you want that authentic feel or something a bit different. That’s why talking to experts such as Amwick Floors should be a priority. Click here to contact us today!